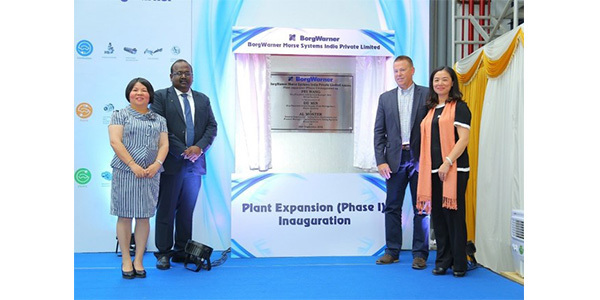 BorgWarner recently celebrated the opening of its expanded facility in Kakkalur, India. With its leading-edge production line for advanced engine timing and variable cam timing (VCT) systems, the expanded plant meets the increasing demand on the steadily growing Indian automotive market for meeting BS VI norms, while preparing to supply the growing Southeast Asian automotive market. With a total area of 43,300 square feet (4,023 square meters), the facility now includes engineering, manufacturing and office areas as well as warehouse space. Located in the Tiruvallur district about 30 miles from Chennai, BorgWarner’s expanded facility provides class-leading design, simulation, testing and manufacturing capabilities. A highly skilled in-house engineering team supports customers from initial design through production, enabling the production of optimized, high-performance engine timing and VCT systems. In the newly built area of the plant, BorgWarner will begin a new production line for the company’s VCT technology to help vehicle manufacturers improve fuel economy, reliability and engine efficiency. The new addition to the production facility opened during a festive event attended by BorgWarner executives and employees as well as the local media. Traditional ceremonies such as a ribbon-cutting, tree-planting and customary prayers took place to wish the facility prosperity. This was followed by a plant tour, a meeting for media representatives and an inaugural meeting with all employees on-site.